Keratosis pilaris is a medical term to describe a painless medical condition that causes white bumps on the skin. More of a nuisance rather than a threat, an article from the Mayo Clinic describes the ailment as a variant of normal skin that can’t be treated or cured. Generally, the bumps appear on the upper arms, thighs, cheeks, or buttocks, but can also appear elsewhere. Great, a skin condition that can’t be solved with a dose of medicine! Hold that thought. While it is true that you can’t cure keratosis pilaris, you can treat the bumps with various home remedies. Usually, it goes away on its own once a person reaches the age of 30. An article from Earth Clinic explains what causes keratosis pilaris. Keratin is a form of protein that develops to protect the skin. However, when there is a buildup of keratin it causes the pores to become clogged. When this happens, small bumps appear on the skin. Scientists are uncertain why keratin buildup occurs. Some research indicates that it may be linked to a genetic disorder, other skin conditions, or simply dry skin. While keratosis pilaris is painless and doesn’t itch or burn, it can still be a bother to those who have it. Let’s look at a few home remedies that will help you treat bumps on your skin. An article from Top 10 Home Remedies states that apple cider vinegar works wonders for keratosis pilaris. The astringent properties work to unclog pores and cleanse the skin. To use: Mix equal parts of apple cider vinegar and water and apply directly to the bumps. Allow the mixture to sit on the skin for a few moments before thoroughly rinsing with fresh water. Test a small section of the skin before applying it to a larger part of your body as some people’s skin proves to be too sensitive for this remedy. 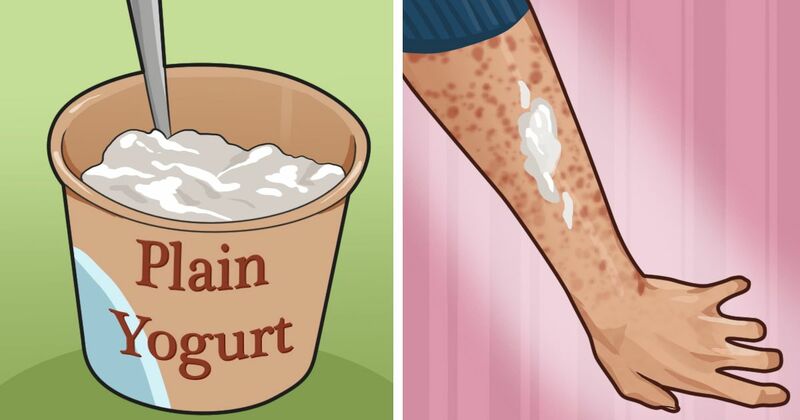 According to an article published on Find Home Remedy, even yogurt can come to your skins rescue. Put a bit of yogurt directly on the dry patch 15 minutes before bathing. It will help reduce dryness and temporarily remove the bumps. Wash off with cold or lukewarm water. An article in Home Remedies for Life describes the benefits of using milk to treat symptoms of keratosis pilaris. Lactic found in milk works to soften and moisturize dry skin. To use: Create a milk bath by adding 2-3 cups of milk to your regular bath. Allow yourself to soak in the tub for at least 20 minutes. For a more deliberate approach, put a small amount of milk directly on the bumps. Oatmeal is a great option for soothing dry skin. It can also work as a gentle exfoliate to remove dirt and dead skin cells. Natural Living Ideas discusses how oatmeal actually works to gently remove the bumps. To use: Make a paste by combining a small amount of water with oatmeal. Apply to your face like a mask and allow it to settle for 15 minutes. Gently remove the mask with a warm washcloth and feel the almost immediate moisturizing results. Similar to yogurt, sour cream is a great alternative to yogurt and also contains lactic acid. A skin scrub made from sour cream and sugar can remove buildup on the skin without over drying. To use: Mix one teaspoon of sugar with two teaspoons of sour cream. Apply the mixture directly to the skin and let it stand for a few minutes before washing off. You can repeat this option two or three times per week. WebMD stresses the importance of keeping the skin moist to help reduce the excessive dry skin associated with keratosis pilaris. Coconut oil is an excellent option for a natural moisturizer. It safely soothes dry skin while also promoting healing. To use: Apply coconut oil directly to the skin after bathing. It is safe to do this several times per day. You can also eat up to three tablespoons per day to promote healthy skin. Aloe vera is known for its soothing properties Many people opt to use the plant for a number of skin conditions including keratosis pilaris. Rapid Home Remedies suggests using the actual plant rather than over-the-counter aloe gels. To use: Apply aloe vera on freshly exfoliated skin. Allow the substance to sit on the face for 5-10 minutes before removing with fresh water. Because it is gentle on the skin, you can use the plant frequently. Don’t let keratosis pilaris get you down. Share these options with friends.